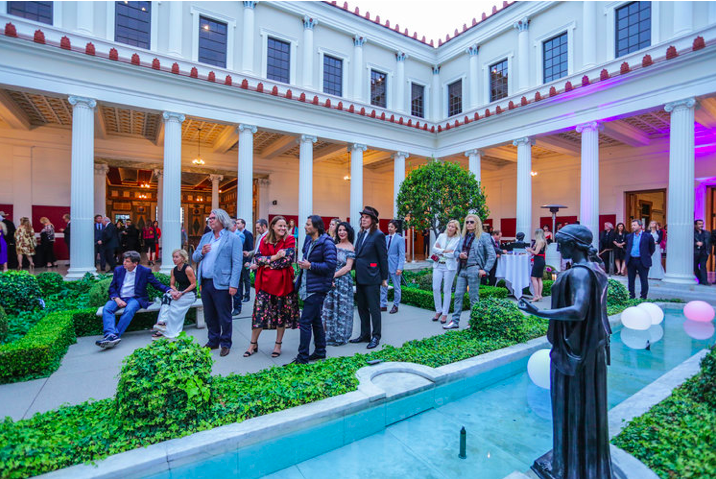 The Getty Villa celebrated Britweek in an exclusive VIP reception and private viewing of the Museum's newest exhibition PLATO IN L.A. The Laboratory Arts Collective Magazine was a proud media partner of this event and members were invited to join the celebration. 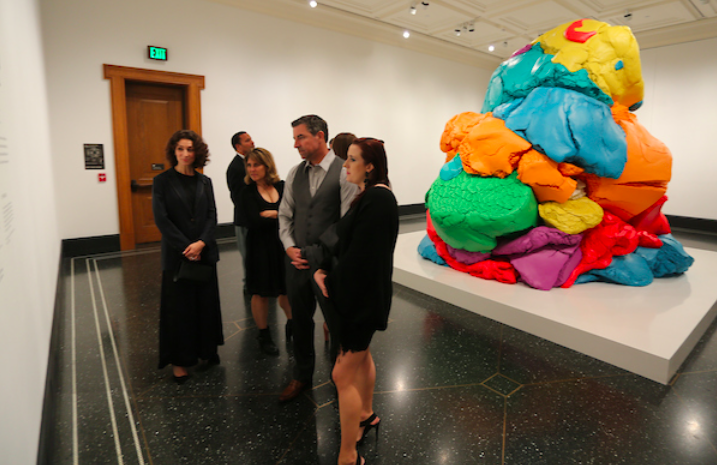 Guests viewed a contemporary take on Plato from a range of celebrated artists that included Jeff Koons and Whitney McVeigh. Guests wandered through the gardens enjoyed a perfect Californian evening, dined on fine food and wine and visited the contemporary art on display. It was the first time The Getty Villa had shown contemporary work alongside their superb collection of antiquities and it was beautifully curated by Donatien Grau. The exhibition Plato in L.A. successfully brings the ancient teachings of Plato into our modern consciousness. The playfulness of the Koons sculpture is wonderfully complimented by the provocations of the other works on display. Taking the viewer into a deeper experience, a dialogue was struck up between some chosen sculptures and the poetry of Gabriele Tinti. 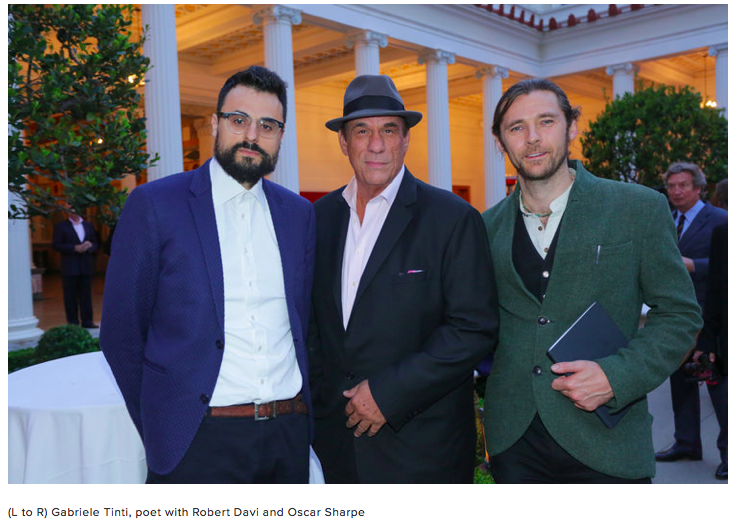 Actors Robert Davi and Oscar Sharp were invited to read. The surprise of the evening was the power of Tinti's poems alongside his chosen statues. The conversation became very real as the ancients were brought directly to those who gathered to listen. A powerful dialogue bridged the past with the present. Both the poems and the art were brought to life and made relevant by the existence of the other. It was a literary reflection of the contemporary exhibition and a reminder of the timeless human journey as defined in Plato's philosophies. The Victorious Athlete is a poem that I wrote especially as a tribute to the work of art on display at the Getty Villa in Los Angeles. 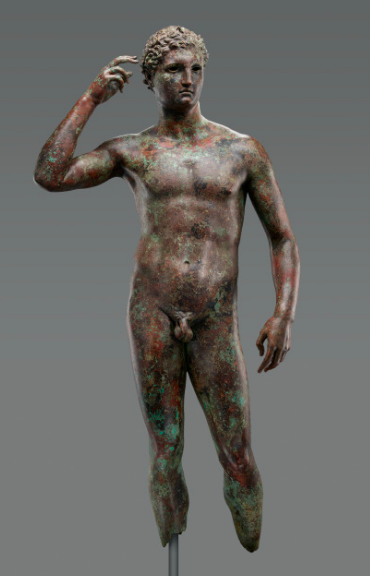 The sculpture - also known as the Getty Bronze, the Atleta di Fano and the Victorious Youth - is one of the very few Greek originals in bronze to have come down to us that can be attributed to a master of antiquity. Attributed on the basis of style to Lisippus (Paolo Moreno), it depicts a young athlete just crowned, caught in the act of emphatically pointing to the wreath with his right hand and to the palm branch, which was also a symbol of victory, with his left. The strong leg muscles suggest a runner. The cavalier attitude suggests he was not a professional athlete though, but a noble who took part in the races. Scholars have strained to identify him as a historic figure: some (Frel, Pasquier) as Demetrius Poliorcetes, others (Paolo Moreno, Antonietta Viacava) as Seleucus Nicator. Other theories identify the athlete - considering the numerous analogies and success of this iconographic form in the Hellenistic and Roman ages - as Hercules or as the very image of Agon (Victory in the athletic races). Scholars do agree, however, on the evidence that the figure must not have been alone as his left side is particularly flat. This would suggest the presence of at least one other statue, but here, too, it is not known whether it was of the father proud of his son’s successes, or the referee caught at the moment of the coronation. It is in any case likely that Lisippus, at the time the ‘court sculptor’ to Alexander the Great, wanted with this work to create the figurative model of the new generation of victorious condottieri who, led by Alexander himself, conquered Greece and the eastern Mediterranean. The J. Paul Getty Museum, Los Angeles. Digital image courtesy of the Getty's Open Content Program. The torch bearers participating in this contemporary exhibition are the following celebrated artists. 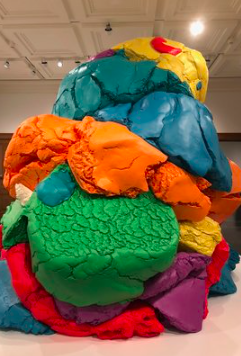 Paul Chan, Rachel Harrison, Huang Yong Ping, Mike Kelley, Jeff Koons, Joseph Kosuth, Paul McCarthy, Whitney McVeigh, Raymond Pettibon, Adrian Piper, and Michelangelo Pistoletto.